Summer is rolling to an end and the kids are getting ready to head back to school. 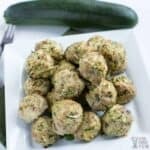 So, I’ve been taking a little time from recipes so I can enjoy the summer before it’s over. We have been making some Fat Head pizza on the grill. 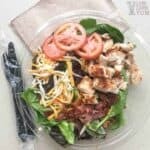 And, I’ve been using my homemade low carb pizza sauce with no sugar added. 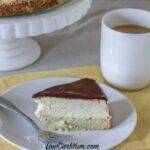 I did, however, have some time to make this low carb gluten free Boston cream cheesecake last weekend. It looks a lot more involved than it really is so don’t be afraid to try it because it looks complicated. It’s so easy to put together. 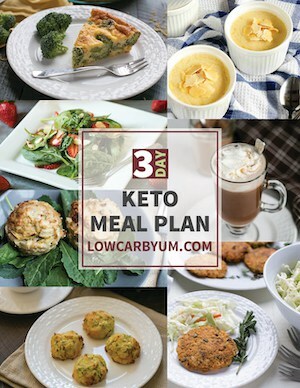 I had a love for Boston cream donuts and I have not yet attempted to make low carb ones, yet. I’m not really sure how you would get the light airy donut that’s needed to fill with the traditional vanilla custard. Donuts have been my only experience with Boston cream as I’ve never eaten the pie or cake. 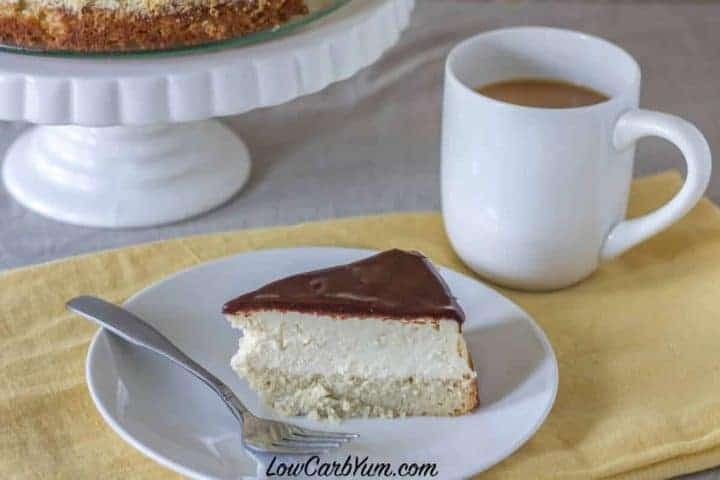 I saw a recipe for Boston cream cheesecake in a Better Homes and Garden cookbook and thought it could easily be made low carb and gluten free. I was right! 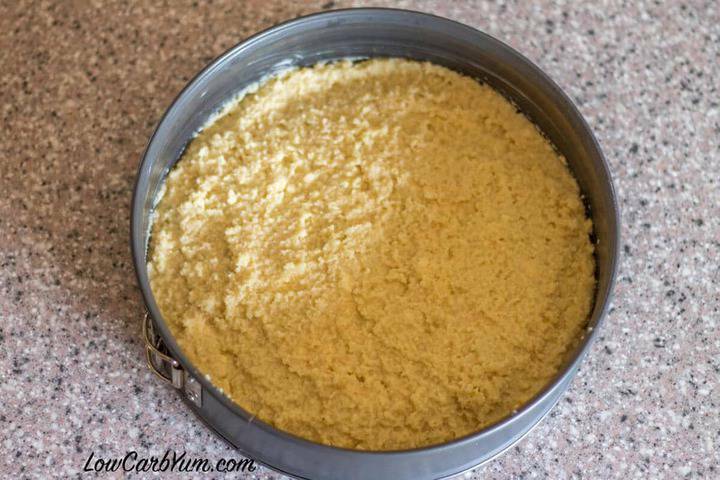 For this cheesecake, you will need a springform pan and the sides will have to be greased well if it’s not a good non-stick surface. 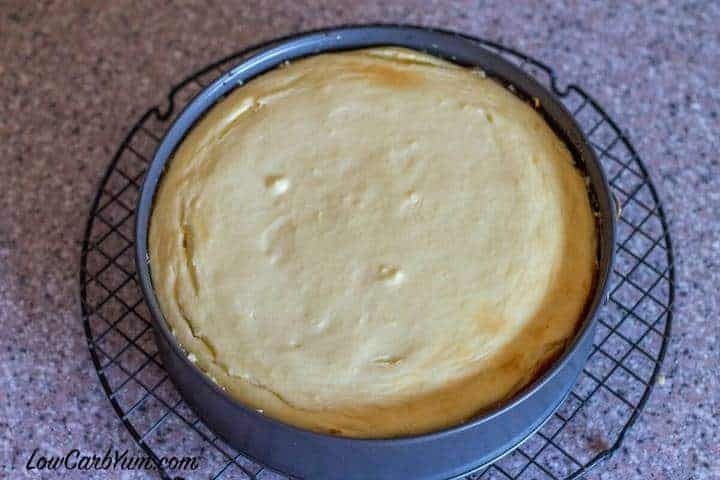 The sides of my cheesecake did stick a bit to the sides, but running a knife along the inside of the pan prior to expanding the sides did the trick for easy release. 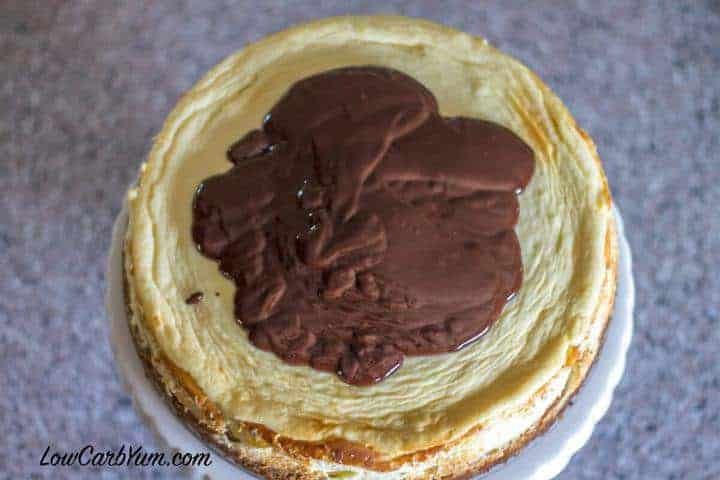 This is a layered cheesecake with a gluten free cake at the bottom rather than a crust. 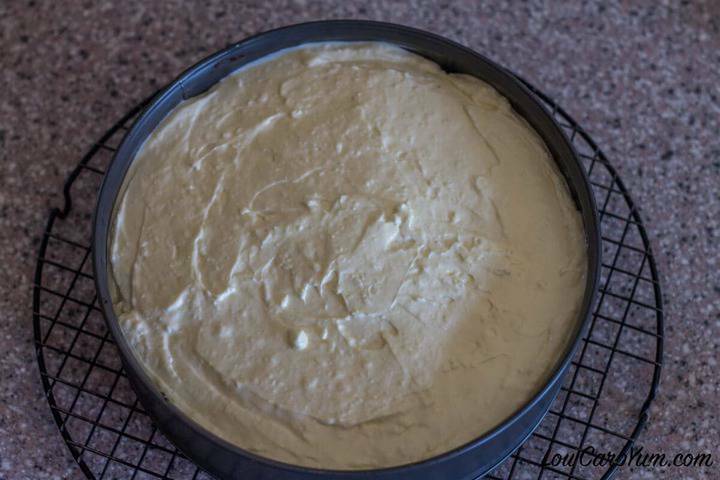 The cake needs to be baked fully before putting the cheesecake layer over the top. After about 25 minutes in the oven, the cake should be done. Then it’s time to whip up the cheesecake batter which is a creamy mix of cream cheese, sour cream, eggs, vanilla and sweetener. Some may argue that this really isn’t a Boston cream pie because the famous vanilla cream is missing. Well, that is true because it’s replaced with a vanilla flavored cheesecake instead. 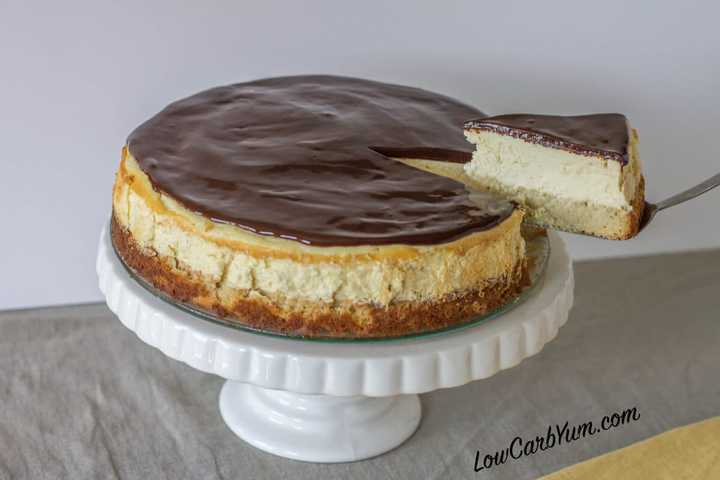 Okay, so it may not have any custard, but it still incorporates all the flavors and idea of the Boston cream pie. 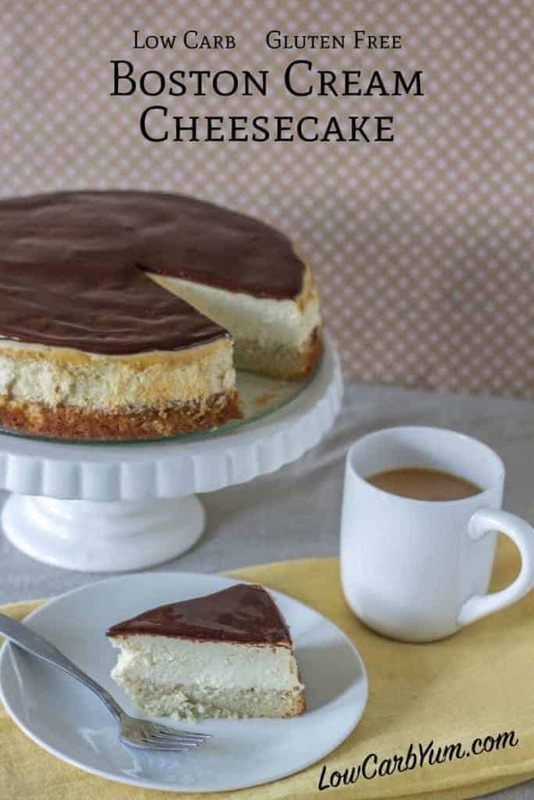 And, cheesecake is as delicious if not better than custard, right? I just love a baked cheesecake, don’t you? 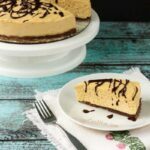 It may not be as easy as blending up a no-bake mix, but there’s just something extra special in a baked cheesecake that isn’t there in the no-bake versions. To make the chocolate glaze, I used a whole 3 ounce bar of Lily’s dark chocolate. 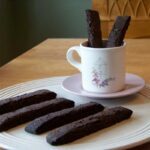 I find the prepared chocolate works much better than trying to make one with your own low carb sweetener and cocoa or unsweetened chocolate. 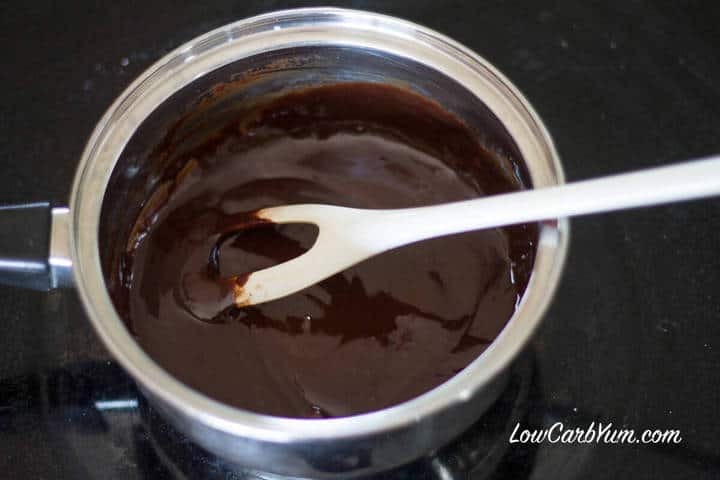 Once the chocolate mixture is completely blended, it needs to cool off a bit before spreading on the cake. You can drip a bit of chocolate down the sides if you wish, but I chose to keep it all on the top. 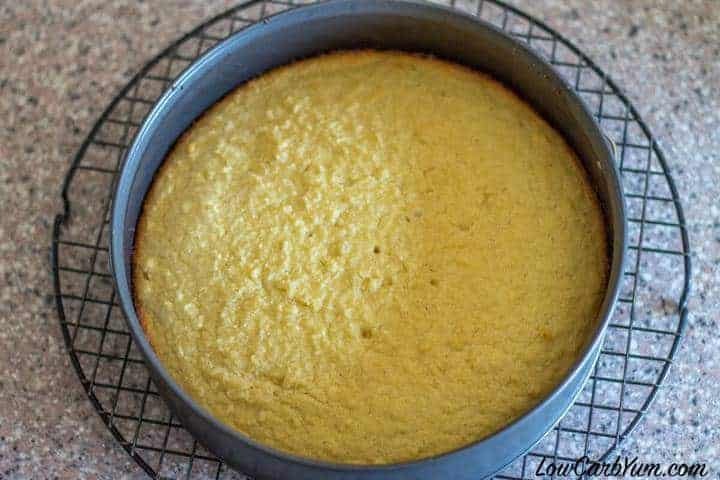 Since this is a pretty rich cake, cutting the whole thing into 16 slices will keep the portion to a size that keeps calories and carbs within reason. 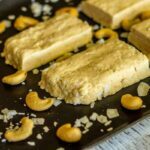 Each thin slice has about 3g net carbs. Most cheesecakes freeze well, and this one should be no different. 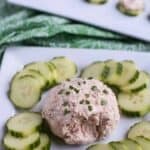 If you aren’t taking this to a party to share or have a large family that will eat it, you probably want to freeze the individual slices to enjoy later. 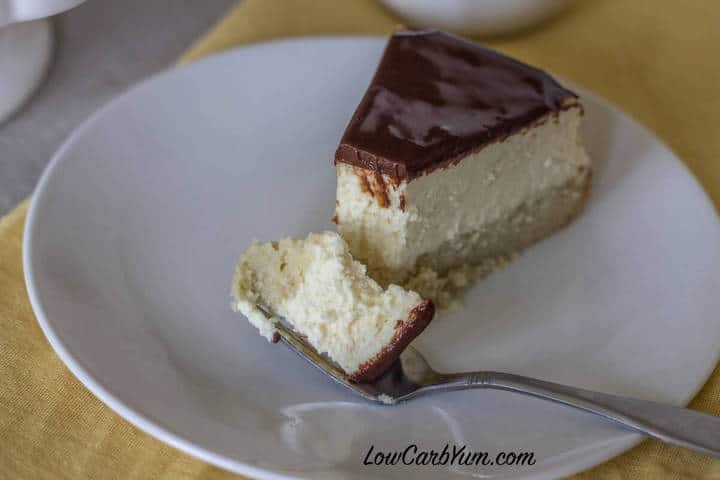 It’s easy to overeat this yummy gluten free low carb Boston cream cheesecake! 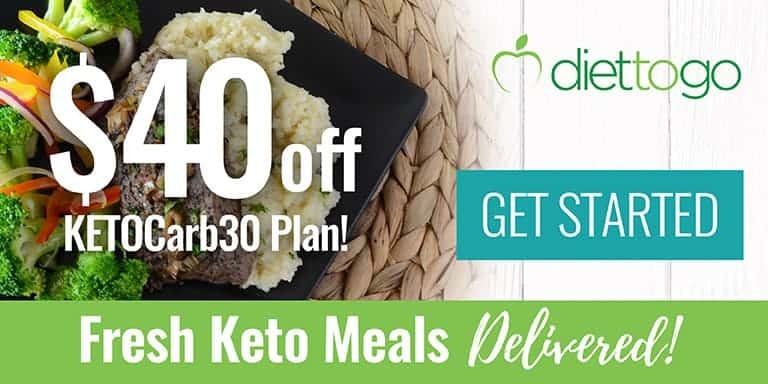 No time to bake a cheesecake or staying away from dairy? Try this dairy-free coconut custard instead. 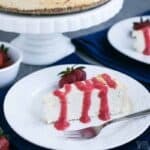 A fabulous low carb cheesecake that bakes up in no time. 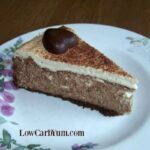 It's got a layer of gluten free cake topped with cheesecake then a layer of chocolate! 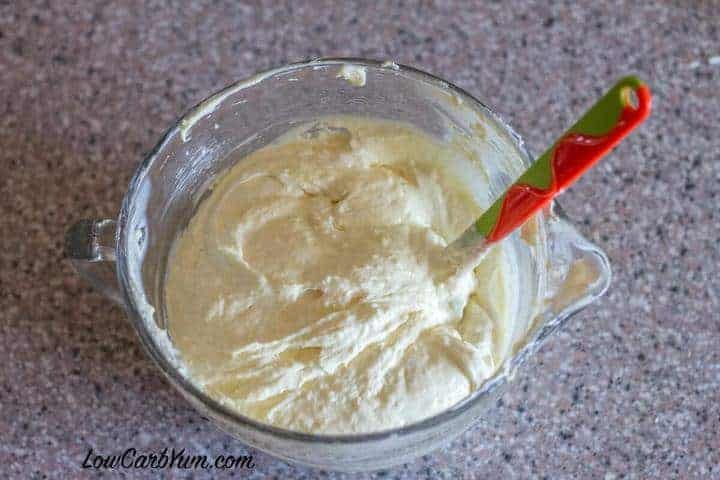 In bowl of stand mixer cream butter and sugar together until light and fluffy. Add eggs and vanilla and continue mixing until smooth. Add flour mixture and milk in alternating amounts, starting and ending with flour. Stir until just blended. Pour in springform pan. Bake for 25 minutes until center is set and toothpick comes out clean. 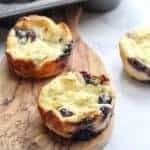 In bowl of stand mixer beat cream cheese, sugar and vanilla together on medium-high speed until smooth. Separately whisk eggs with a fork in a small bowl, add beaten eggs to cream cheese mixture on low until just combined. Stir in sour cream. Pour mixture over cake in the springform pan, spreading to cover. Bake for 45-50 minutes until the outside edges appear set when gently shaken. Cool in pan on a wire rack for 15 minutes. When cheesecake is chilled heat heavy cream in a small saucepan until it almost comes to a boil. 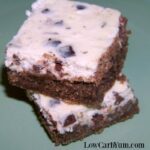 Remove from heat and stir in chocolate chips until melted. Stir in butter until smooth. Chill for 15 minutes and then spread over top of cake.